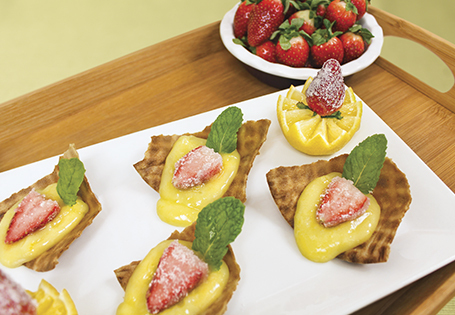 Lemon filling atop bite-sized pieces of waffle cone, topped with sugared strawberry. In a medium bowl, whisk together egg yolks and 1/2 cup sugar. In a small saucepan over medium heat, whisk corn starch, water, 1 cup of sugar and salt. Bring to a boil, continue boiling for 1 minute. Mixture should have the consistency of pudding. Remove from heat and temper into egg yolks, whisking one tablespoon at a time, until there is about half the mixture remaining. Stir the egg yolks back into the pot and cook on low for 1 minute. Add butter and lemon juice. Remove from heat and stir until well combined. Over a medium bowl, strain the mixture, then add lemon zest, and stir to incorporate. Refrigerate for 15 minutes. Break cones into pieces and top with lemon mixture. Roll strawberries in remaining ½ cup sugar and place on top of lemon filling. Garnish with mint and serve. TIP: Straining lemon curd is a key step to remove any egg that may have solidified during the cooking process. This curd may also be used as a fruit dip, or is equally delicious paired with cookies and sweet crackers.